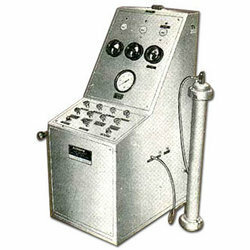 Leading Manufacturer of hydrostatic pressure testing machines and pressure testing control panel from New Delhi. The Elemech Pneumatic Industriesare the leaders in manufacturing high quality Hydrostatic Pressure Testing Machines that have applications in testing the Hydrostatic Pressure. These machines are available with advanced technology features in order to provide accurate and the best results. We are well established in the Indian market as one of the major Hydrostatic Pressure Testing Machines supplier in India. wE ARE BIG MANUFACTURER AND eXPORTER. We manufacture high technology Pressure Testing Control Panel designed to provide high performance and greater strength, and have vast applications in various industries. 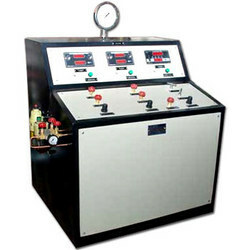 We are well known to manufacture the best quality Pressure Testing Control Panel. 1/2" Pipe connection from an overhead tank preferably soft water. Looking for Pressure Testing Control Panel ?